A toy or tiny toy cream poodle is an exquisite little creature. Its coat is a soft, rich color, which may have some natural shading, especially a slightly darker feathering on the ears or tipping on the ruff. When properly groomed and brushed, the coat of a cream poodle is practically luminous. A poodle’s coat is its pride, and grooming that coat is one of the most important aspects of caring for your pet. Poodles should be brushed frequently, at least every other day, to prevent their coat from getting matted or snarled. Their ears are particularly apt to need attention, as they frequently take dips into the food and water dishes! Hold the leather of the ear gently in one hand and brush the fur carefully with the other to avoid pulling. Use the same technique on the tail puff. Poodles intended for show must be clipped in an acceptable pattern. Puppies under a year old should be shaved on the face, throat, feet and the base of the tail, with a pompon on the end of the tail. 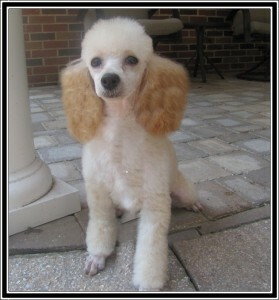 The “Continental” is the most popular clip for adult poodles. The face, throat, feet, base of the tail are shaved, as are the hindquarters, except for optional pompoms on the hips. The legs are shaved, leaving bracelets, and there is a pompom on the end of the tail. Because our puppies at Homestead Poodles are completely socialized, they are used to being handled and should be comfortable with grooming. Owners may want to learn how to clip their dogs, but at first, it is best left to a professional groomer. And remember to give your dog plenty of praise and admiration when he or she is freshly groomed.